I'd have thought we could have counted on Mazda to have known better. 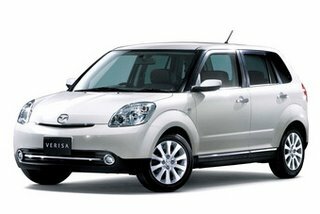 The Verisa, presently for Japan only, appears to be an attempt to make a pointless tall supermini appealing by dressing it up as a Porsche Cayenne. Readers will excuse me for not including an illustration of the latter for comparison purposes. If you don't know what a Porsche Cayenne looks like, just count yourself lucky.